Tuesday, August 27th, 2013 | Author: Bunco Betty! The Bunco group that I belong to is one where we have a potluck meal before we play. We basically have it down to a science: we eat for 45 minutes and then play two rounds of Bunco. Next, we eat dessert for ten minutes, play one round of Bunco, pass out the prizes and then play LCR (which is optional). Whew! We have ladies who love to chat and some who just want to get the show on the road. After three years of playing with mostly the same people we have figured out what works best for us as a group. We are a large group and typically play with 18 to 24 people. One time we had ten people bring dessert. I was hosting and was left with way too many cakes and pies for a family of four to eat! Now we limit it to four people bringing desserts, this way we don’t have an overabundance. I have heard of groups who take turns being the hostess and she provides the food for her assigned Bunco game. This sounds like fun and a great way to host for smaller groups. Our potlucks do not include main dishes. Our games are usually held at 2pm on Sunday afternoons so we prefer appetizers and snack foods. We have some really good cooks who play with us! One of my favorite snacks to bring (I get requests for them!) are Cinnamon Candied Cashews. They are easy to make and delicious. Line a baking sheet with a silicon mat. Put the nuts, sugar, water, and salt into a large skillet over high heat. Bring the mixture to a boil, stirring frequently, and cook until the water is nearly evaporated and the liquid becomes syrupy, about 10 minutes. After 10 minutes, sprinkle the cinnamon over the nuts and stir well. Continue stirring constantly while the water evaporates completely, about 5 minutes. When there is no longer any sugar syrup left in the bottom of the pan, turn off the heat and stir the nuts vigorously but carefully in the pan until the sugar seizes up and the nuts are evenly coated with crystallized sugar. Turn the nuts out onto the silicon mat and spread evenly. Cool completely before storing in an airtight container. 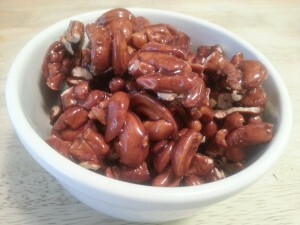 If you put treats on the Bunco tables these nuts would be a great addition to your routine snacks. They would look so cute on these Dice Plates. We used to have a lot of chocolate and hard candies on the Bunco tables. The ladies in my Bunco group do not have much willpower when it comes to snacks being at their fingertips, so we have done away with anything too sweet on the tables. Now we have nuts or dried fruit to munch on and occasionally the candied nuts above for a treat. Does your Bunco group have potlucks or rotate hostesses who provide a meal? Do you have snacks on the Bunco tables? Let me know, I’d love to hear from you!